NOTE: If you have a "Para" version with a side folding stock and a receiver mounted rear side sling swivel, the Universal SOP Sling is the correct application for your weapon. When we designed the SOP sling our intent was to produce the ultimate tactical patrol sling design, incorporating every positive feature suggested to us by end users as well as addressing, and solving, every negative issue relating to conventional 3 point sling designs that we had identified. Since it's introduction into the marketplace, the SOP Sling has been called the next evolutionary step in 3 point tactical sling design. Here are a few reasons why and how it differs from our standard CQB Slings. To begin with 1.5" wide webbing is used for the sling strap. It's exactly the same type of webbing used on our CQB Slings except for being wider. The purpose of the 1.5" width is to better distribute the weight of the weapon. The next difference has to do with how the sling attaches to the weapon. We feel that a good sling design should work with the weapon, not against it. Conventional 3 point slings that are solidly attached to the side of the weapon don't hang well in anything but the Off Side Drop carry mode and have a tendency to bind up and limit efficient movement of the weapon during positional shooting. So, for the SOP Sling, we chose flexible 1" attachment straps to be used at each end of the sling to interface with the mounting adapter sling loops or sling swivels. The 1" straps move, shift and conform within the sling loops to allow the SOP Sling to move more efficiently with the weapon thus enhancing free movement of the weapon and allowing the weapon to hang in a more vertical orientation while being used in the Military Patrol Ready carry mode. Another change is the ability for this sling to be set up for left or right handed operators. All of our SOP mounting adapters (If applicable) are set up with right and left hand mounting points. With the attachment strap feature it's a simple matter to attach the sling to the mounting adapters for use on either side. So, there is no right or left hand specific version necessary. The adapter strap feature also allows the user the flexibility to experiment with user specific custom mounting solutions. Those are all great features. However, the feature that sets this sling apart from any other is the Transition Release Buckle (TRB). The TRB allows the sling to be quickly and efficiently extended to instantly create slack that allows for easy left/right shoulder transitions. 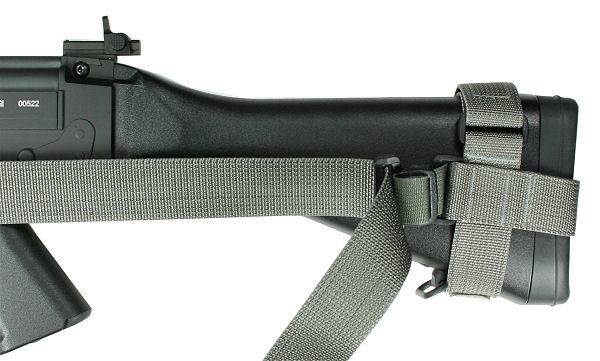 This feature addresses a common complaint associated with conventional 3 point tactical sling designs. With those types of slings it's very difficult, if not impossible in some cases, to execute a cross shoulder transition. This creates a serious problem in an urban environment. With the TRB feature the sling can be used exactly like a conventional 3 point design, allowing all of the same carry options. However, when the need to cross shoulder transition is anticipated, simply flip the TRB release with the non firing hand thumb and the 3rd point of the sling is silently released to slide freely along the sling allowing you to extend and mount on the opposite shoulder. The sling, however, is still attached and still functional allowing you to "let it hang" should a secondary weapon transition be called for.